from which shoots and buds arise. At first glance, that definition sounds a little clumsy. However, below you'll see that stems can by tricky. For example, several kinds of stems grow beneath the ground. Sometimes, to figure out whether a plant part is a root or a modified stem, you have to analyze it. 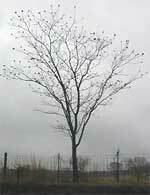 You have to notice where the plant's shoots and buds arise. If shoots and buds arise from it, it's a stem. At the right you see a green onion from my garden. The green shoot above it is arising from the spherical bulb, so, remembering our definition, the bulb must be a much-modified stem, right? That's the case, even though the bulb grew below the soil's surface. The white, hairlike things arising from the bulb's bottom are roots. The "classical stem" is a tree trunk, which in a no-nonsense manner simply rises from the ground and supports the tree's leafy branches -- like the Winged Sumac shown at the left. In our backyards, an important variation on this simple theme is that of having multiple stems -- two or more stems arising from the roots, in the manner shown below and to the left by the Chinese Privet bush. Clumps of grass and certain bushes use this strategy. Clumped stems tend to protect one another from cold wind and hot sun, plus, if one stem breaks, it's less loss to the plant because other stems are available. On the other hand, if a plant invests its energy in many stems, then it's unable to grow as high as it could with only one stem, and therefore may receive less sunlight than its taller neighbors. Another important stem variation is the climbing stem. In our vegetable gardens, climbing beans have such stems, as do grapevines and morning-glory vines. 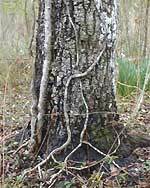 At the left you can see Poison Ivy vines climbing up a tree trunk. 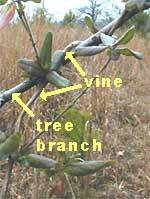 At the right you can see a Japanese Honeysuckle vine twining around a tree branch. Notice at the top, right in the picture how the vine twists around the tree branch. If you think about it, having a climbing stem is a kind of sneaky adaptation. Essentially it enables the climbing plant to reach toward the sun without having to invest its own energy in building stiff, strong trunks or stems capable of holding themselves erect. 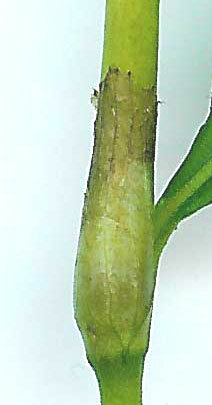 Climbing stems typically wrap themselves around their support-host. Prostrate stems merely trail across the ground, clamber over, or lean upon other plants, rocks, fences, or whatever happens to be in the way. Cucumber, winter squash, and sweet potato vines have prostrate stems. Before going any further, let's understand the term "node." The bamboo stem shown above is jointed, right? Well, those two thickened joints are nodes, and the smooth, slender zones between the nodes are called internodes. Nodes and internodes are important to know about because the vast majority of flowering-plant stems have them, though they're seldom as obvious as on bamboo stems. Also, since leaves, flowers, and fruits generally arise from buds located at nodes, on stems, the interesting stuff happens at nodes. At the left you see an example of "interesting stuff happening at a node." This is on the stem of a common, herbaceous plant growing in moist to wet soil. It's Polygonum hydropiperoides, sometimes called Water-pepper. The swollen area where the leaf attaches is the node. But notice that on the stem above the node there's a brownish, cellophane-like membrane with obscure, slender, parallel veins. The membrane surrounds the stem like a cylinder. This is a stipular sheath. Such sheaths are typical of a small number of plant families. In other words, if you are trying to identify a plant and you notice that it has stipular sheathes, you can narrow down the possible names drastically. In North America the family most commonly showing stipular sheaths is the Smartweed Family, the Polygonaceae, and Water-pepper is a member of that family. Stipules, behaving like thin coats, protect young plant parts as they emerge. Stipules occur in many families but usually they fall off soon after they are no longer needed, or else they are like inconspicuous little ears instead of cylinders, as in the case of the Smartweed Family. Now you may want to look at our stem modifications page, where you'll probably see some things you've already heard of, but didn't know that they were stems!